You have probably noticed how shootings have increased in the US, especially in schools. As much as we may want to blame Trump and the lawmakers for not making tough gun control regulations, some of these shootings are, honestly, due to our own negligence. Maybe you have a revolver or even a rifle, and you happen to keep it in a drawer somewhere, with a small padlock that anyone can snap. What if your son or daughter or their friends, decided to break it and play truth or dare with that firearm? They might not even mean to do any harm, nonetheless, it’s very important to ensure they don’t have access to your firearms. 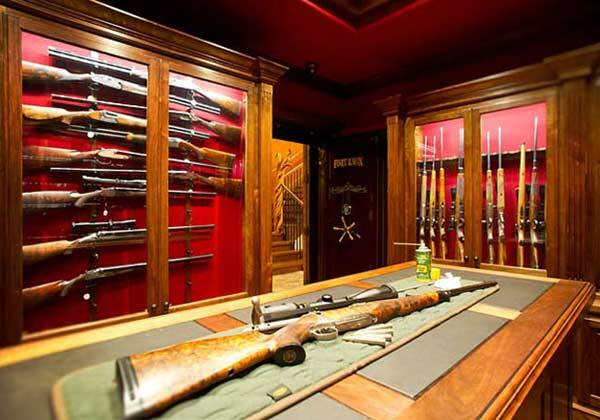 The best place for storing guns is in the basement. As long as you have a well-constructed vault, then you don’t need to fret about your firearms falling in the wrong hands. So, here, you will learn how to build a gun vault in the basement. We will also give you a few tips on gun safety. Build a wall of interlocking cinder blocks as an enclosure for the vault. You need an enclosure of three walls built to mason’s standards. You are to reinforce these walls with Portland cement and rebar in 3 areas. Don’t forget to set each of the cinder blocks with a uniform mortar so the walls stay well-levelled till you’ve reached your desired height. Use Portland cement as the enclosure’s roof. When the door is closed, there’ll be minimal chances for air to get in. That’s why you need to drill a hole through the roof so air gets in freely. But, before drilling the hole, give your concrete roof time to dry completely. We recommend buying a premade gun vault door. The benefit with a premade door is that it’s built to high safety standards specifically for storing valuable/sensitive goods. It employs great lock and release mechanism so that your firearms have optimal protection. In most cases, the hardware for attaching the vault door is provided by the dealer. Construct another enclosure in the vault for storing the weapons. You can construct this one on a corner somewhere in the vault, by adding cinder block 2 columns. You can use the entire vault for storing your guns, but the smaller vault will provide extra protection the more sensitive weapons or other valuables like money and jewelry. According to Steve Sanetti, NSSF’s CEO, most firearm accidents at home could be prevented by the owners taking easy precautions and using proper storage mechanisms. Sanetti affirms that firearm owners need to respect and secure their weapons to thwart misuse and accidents. NSSF stands for the National Shooting Sports Foundation, and is in charge of promoting, protecting, and preserving shooting sports in the US. Keep the muzzle pointed such that if there was a discharge by accident, there wouldn’t be injury. Don’t place your finger at the trigger unless you’re intending to shoot. When holding a firearm, rest your fingers along its side, and not within the trigger guard. When they’re not in use, unload your guns. After your shooting expedition, be sure to remove the ammunitions before placing the guns back in the storage. Ensure that you know how to operate your firearms fully. Make sure that you read those user manuals. Know how to open and close the gun’s action safely and know how to remove the ammunitions from the magazine safely. Store your guns in your gun vault at all times. this vault should be locked at all times, unless of course, you’re in there. Also, only you (and perhaps those family members that are authorized to handle guns) should have the key. Store your guns and ammunition separately. Utilize a firearm locking gadget to render your firearms inoperable when they aren’t in use. You should use this gadget as an extra safety measure and not as an alternative to safe storage. Educate all minors in your home about the safety guidelines for firearms. Ask them to sign the Project ChildSafe Pledge that obliges them to not touch unattended firearms but rather notify adults about them. Hooray! You’re done. Now you have a reliable means of keeping your weapons safe. If an intruder comes to your house, there are low odds they’ll lay their hands on your weapons. Your family is also safe from these weapons. Don’t forget to observe the safety measures we have talked about. Share these insights with your friends.